783 million people worldwide – equivalent to one in nine people, still don’t have access to clean water. Water systems are continuously installed but 65 per cent break within the first two years because there is no sustainable method of maintaining them. Water, Sanitation and Hygiene (WASH) advisors are all too aware that the traditional model relies too heavily on unreliable water committees to collect user fees and carry out maintenance. As a result, often generously donated solar pumps and filtration systems can be left broken for years, particularly in war-torn regions where a charity has had to withdraw and slowly the infrastructure fails to deliver. For the world’s poorest people a sustainable solution must provide easy and affordable payment per use and in-country maintenance of the water supply, while creating local employment opportunities. eWATER provides a sustainable, proven solution by using mobile technology for the transparent and accountable collection of user fees to ensure sustainable maintenance. To achieve this eWATER fully integrates three technologies: Mobile money, Internet of Things (IoT) and Near Field Communication (NFC) to manage the provision of clean, low-cost water, which is accessible 24/7. Whilst a solar powered pump, filtration system, tanks and local water distribution system is being installed or repaired, eWATER trains local engineers to maintain the system and upgrade communal taps. The upgrade includes replacing handpumps or leaky unreliable outlets with a smartcard reader, communications hub and solar powered electronic valve. To use the new tap, anyone can present an eWATER NFC tag. Upon reading the tag, the valve will open allowing the flow of clean fresh water. Key to ensuring the tap is working and maintained is the connection to eWATERcare, making it a true IoT appliance. The cloud-based eWATERcare application receives information on functionality, flow rates and sales in real time, allowing unusual behaviour to be highlighted and quickly passed to the local maintenance engineer. With local skills, reputation and pride involved, the engineer can quickly visit the affected tap to ensure repairs are carried out within hours of a server alert. Anyone wishing to use the system obtains an eWATER NFC tag from a local shop. The tag may be charged with credit using a Smartphone that includes NFC functionality. Since many eWATER customers may not have a Smartphone, the system has been designed to allow anyone in the village to become a local distributor for eWATER credit. This is likely to be a shopkeeper who will purchase water credit in bulk using the integrated mobile money platform (eWATERapp). Anyone can then purchase water credit from the seller for cash, by touching their eWATERtag to the seller’s phone. eWATER required a method of collecting functionality information from the taps, to ensure repairs could be made as quickly as possible. The communications system would need to give confidence to investors and their global team that 100 per cent of the usage and performance data would be communicated to the servers in a timely manner. More important still was to provide every eWATER customer with the confidence that the tap will be working, and supply them with clean fresh water whenever they need it. Scalability was also essential. 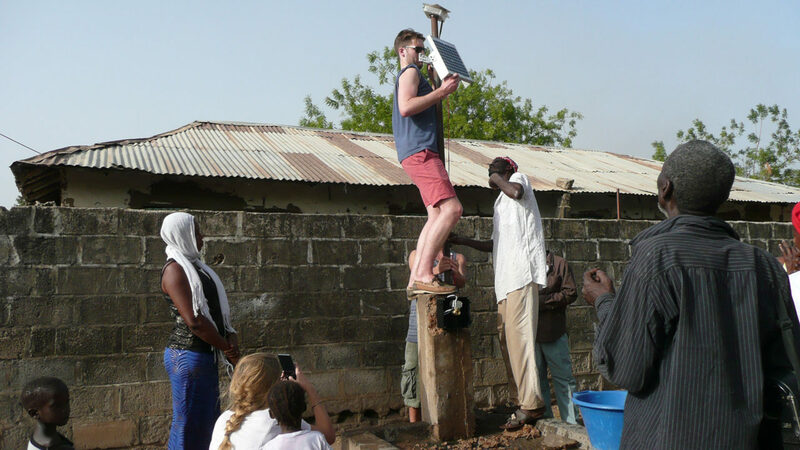 eWATER already operates across Gambia and is looking to install taps in Tanzania. Fundamentally, eWATER taps need to be installed wherever a community needs them and so require reliable wireless communication from wherever that may be, without needing any additional infrastructure to be installed and maintained. eWATER has skills and experience ranging from system architecture and design of electronics and software, to explaining the system and building taps in developing regions. However, the company’s engineers realised that to get the level of IoT connectivity needed, external expertise was required. With the grant support of the GSMA Mobile for Development Utilities Innovation Fund, eWATER turned to Eseye, which delivers highly secure and resilient cellular data services through its AnyNet and AnyNet Secure™ Subscriber Identity Modules (SIMs). These SIMs provide unique zero-touch, highly secure, remote device provisioning with the ability to roam across more than 440 worldwide mobile networks. The solutions provided by Eseye and eWATER mean 13,000 people currently have access to clean water 24/7 by ensuring maintenance companies receive up-to-date information on the state of the taps, and so can repair them promptly. This is forecast to increase by up to 10 million people over the next five years through the instillation of 100,000 more taps. 100 per cent of transaction data can also now be collated, which is crucial in the visibility of cash flow and ensures payment can be made to maintenance companies to repair the taps. “We pride ourselves on ensuring we never lose a single revenue transaction. By collecting 100 per cent of water revenue means we help local communities keep their water resources maintained for ever. Eseye and its global IOT network ensures eWATER always sends and receives data when we need it, and at a cost effective price,” Rob Hygate, eWATER.